Kaoru Yosano (与謝野 馨, Yosano Kaoru) (August 22, 1938 – May 23, 2017) was a Japanese politician. He was born in Tokyo. 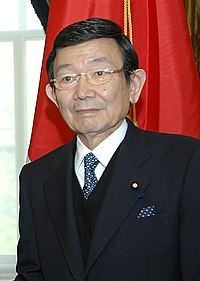 Yosano was a member of Liberal Democratic Party (LDP), the Sunrise Party of Japan and former member of the House of Representatives, serving his ninth term in the Lower House representing Tokyo's first electoral district until his defeat in the Japanese general election, 2009. Yosano was Chief Cabinet Secretary to Prime Minister Shinzō Abe from August 2007 to September 2007 and was State Minister in charge of Economic and Fiscal Policy in Tarō Asō's administration from February to September 2009. Yosano died of pneumonia on May 23, 2017 in Tokyo at the age of 77. ↑ Yoshida, Reiji (2017-05-24). "Former lawmaker and finance chief Kaoru Yosano dies at 78". Japan Times. This page was last changed on 25 May 2017, at 01:37.